Classique maison de style fédéral historique au cœur du centre-ville Edgartown sur la vigne de Martha. Cette belle maison de 4 chambres a toutes les commodités et dort 8. Marchez dans tous les magasins, le port, les restaurants, les plages et le ferry Falmouth-Edgartown! Cabine de douche en plein air, manger dans la cuisine, 2 voitures de stationnement hors rue, cour clôturée et grande terrasse pour manger ou se détendre. La maison dispose d'une chambre avec salle de bain en bas, le roi et 3 chambres et une salle de bain à l'étage avec 2 lits jumeaux dans chaque chambre. La maison est dans un endroit fantastique avec une ambiance confortable et classique. S'il vous plaît nous envoyer un email et nous serons heureux de vous envoyer plus de photos. Grande douche extérieure privée - le seul endroit que nous ayons jamais douche! Great location !! Access and communication very easy! Older Home so a bit tired but location is amazing !!! 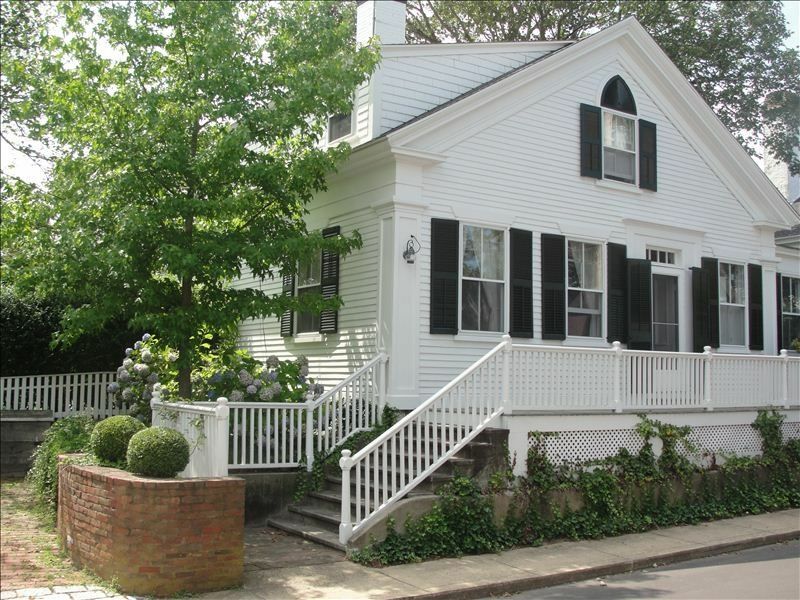 My family loved staying in this home in Edgartown. Perfect walking distance to shops and restaurants, and also a nightly walk to the lighthouse. The owner was very fast to respond to my question while we were there, and the house was beautiful. We spent every afternoon relaxing on the back porch. It is on a slightly busy side street, so there was some noise at night with people walking by, so we realized we couldn’t sleep with windows open. We had the best vacation, can’t wait to go back!! The homeowner was very accommodating , helpful and answered questions right away. The house was spacious and comfortable. The downstairs shower was great but the upstairs shower was good if you were short and the pressure wasn't great. It was too cool to take a shower outside. I would highly recommend this house for a wonderful vacation. Wonderful home for our group of eight attending a wedding on the island. The house was so convenient for getting in and out of town. The back deck in particular was a hit for outdoor snacks and early fall sun. Plus, great outdoor shower. Thank you! I have never stayed on a property that felt more like home. The dining room and living rooms had plenty of seating. The beds - all of them - not just the master - were extremely comfortable. Anything you can imagine needing on a weekend away was there. This beautiful home is just a couple blocks away from the harbor. The homeowner is wonderful, so accommodating and easy to coordinate with. Would say here again in a heartbeat!! Perfect location for our wedding events. Fantastic location, comfortable house, plenty of space including the four bedrooms, kitchen was functional, deck private and comfortable.